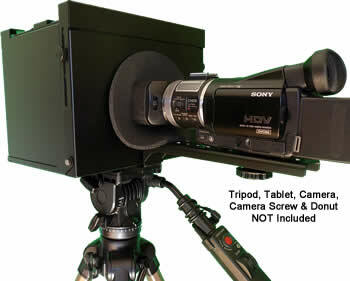 Quick Mount DSLR's, Digital Video Cameras, Studio Cams, Jibs or Steadicams. PRBOX4PRO mounted using the 1/4-20 bottom tap. This Special Offer is SOLD OUT! 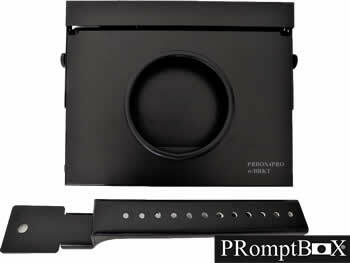 The PRomptBox™ is the answer to lightweight, streamlined prompter shoots. Heavy tripods and bulky teleprompter equipment are no longer needed…all you need is the PRomptBox™ and an Andriod or iOS smart phone or tablet to have versatile “Walk and Talk” prompting anywhere you need it! 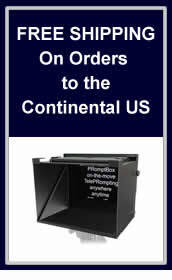 PRomptBox is used by professionals, and priced within reach of bloggers or anyone making videos. With essential low-profile storage and portability, PRomptBox is perfect for shoots in remote locations – and it requires no power, just your charged phone or tablet. The NEW PRomptBox PRBOX4PRO works with 7", 8" or 9" tablets. Check out the PRBOX4PRO Assembly Instructions!